this year, my daughter asked for an edible arrangement for her birthday. and while she still got a cake for all her guests (thanks to gramma for the wonderful cake! 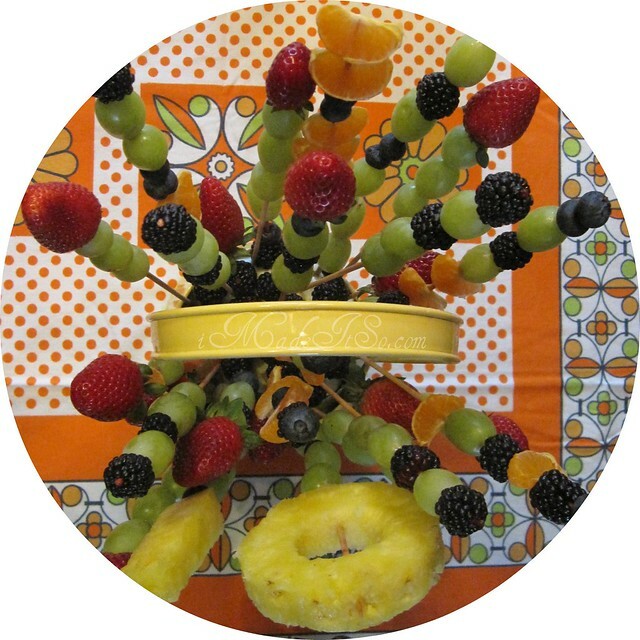 ), i decided to try and make my own fruit arrangement for her. 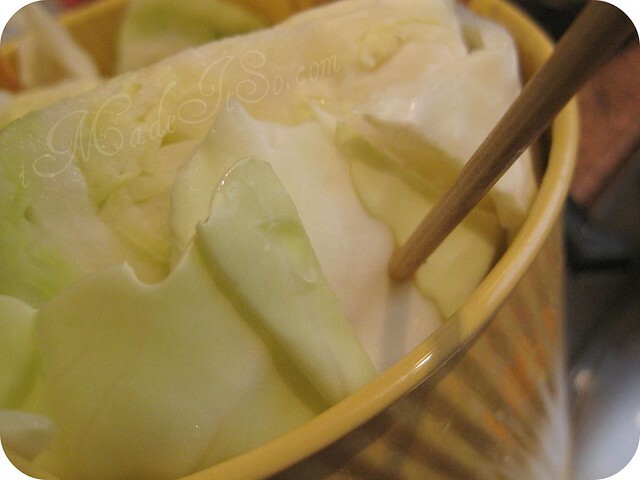 i washed all the fruit, then cut a cabbage to fit into the bottom of a basket. this was the base into which i arranged the skewers of fruit. i loaded up the skewers with fruit (just as you would for kebabs) and used different lengths of skewers to shape the arrangement. i was making it up as i went, and honestly, it was so easy and fun. and if it wasn’t a surprise, i would have involved the kids in the process too (just watch the sharp end of those skewers!). once all the skewers were in, i covered the cabbage base with some blackberries and blueberries. and everything (minus the cabbage) got gobbled up pretty quickly. 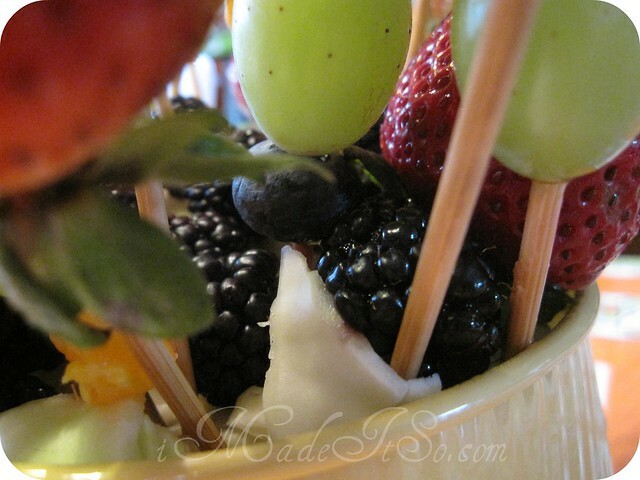 This entry was posted in ideas & inspiration, in the kitchen, tools, tips and techniques, vegetarian recipes and tagged basket of fruit arrangement, cabbage base for fruit arrangement, edible fruit arrangement, how to make fruit arrangement. Bookmark the permalink. aw the 10 out of pineapple is so cute!! Great idea. they do get eaten more quickly. partly because they’re easier to eat, but also because it’s a bit more fun i think. hey, whatever works. that is absolutely brilliant and yummy and what a sweet surprise it must have been!!! perhaps I’ll have to make my own thanks to inspiring you Mz Ana! yes, make your own! i can see you cutting out an intricate swan out of a honeydew or something. That was a courageous undertaking. It turned out fantastic! I love the using a cabbage as the base and the pineapple numbers. That fruit looks sooo good! I’ve had a sinus infection and haven’t been able to taste anything for a week- it’s a very weird sensation. 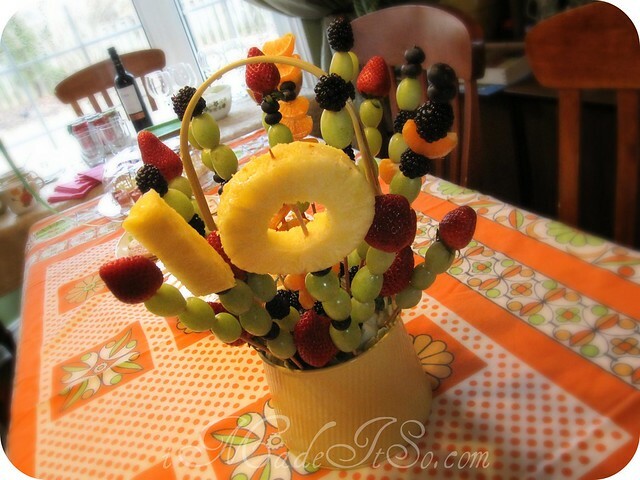 Your basket came out beautifully, and the pineapple numbers are a great idea! That looks great but with the sweet-tooth I have, I gotta have my cake! you just gave me an idea. i could make this with those cake pops stuck in throughout, for those who… you know, want their cake too. I got really excited when I saw the 10! Cool idea. Well done and really cute! 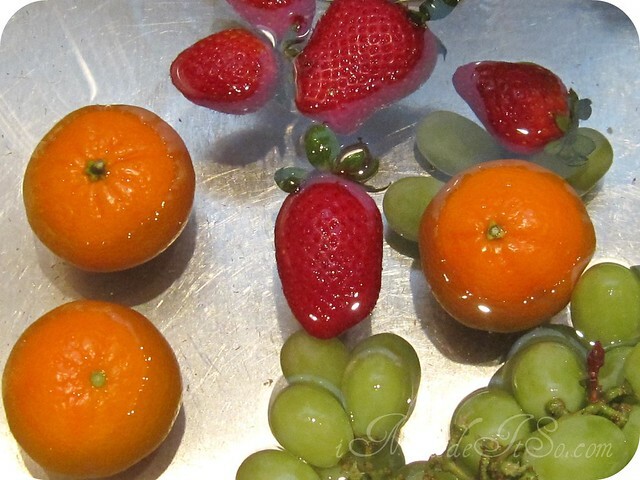 what did you coat the fruit with to prevent it from turning colour after cut and making it so shiny? hi rhonda, i didn’t do anything. i made the arrangement the morning of the event, covered it with plastic wrap and put it in our cold room. i guess you could use glazes, or i’ve heard that brushing cut fruit with citrus juice helps slow down discolouring.